"Sunsets are always better on a cruise." - Anonymous. A CRUISE LINE is a company that operates cruise ships. Cruise lines have a dual character; they are partly in the transportation business, and partly in the leisure entertainment business, a duality that carries down into the ships themselves, which have both a crew headed by the ship's captain, and a hospitality staff headed by the equivalent of a hotel manager. Among cruise lines, some are direct descendants of the traditional passenger shipping lines, while others were founded from the 1960s on specifically for cruising. The business is extremely volatile; the ships are massive capital expenditures with very high operating costs, and a slight dip in bookings can easily put a company out of business. Cruise lines frequently sell, renovate, or simply rename their ships just to keep up with travel trends. A wave of failures and consolidation in the 1990s has led to many lines existing only as "brands" within larger corporations, much as a single automobile company produces several makes of cars. Brands exist partly because of repeat customer loyalty, and also to offer different levels of quality and service. For instance, Carnival Corporation owns both Carnival Cruise Lines, whose former image were vessels that had a reputation as "party ships" for younger travellers, but have become large, modern, and extremely elegant, yet still profitable, and Holland America Line, whose ships cultivate an image of classic elegance. Currently the five largest cruise line operators in the world are Carnival Corporation & plc, Royal Caribbean Cruises Ltd., Star Cruises, MSC Cruises and Louis Cruises. 2018 unbelievable cruise ships setting sail - The Telegraph. Cruise Critic - "Cruise Critic Message Board Forums." CRUISING HOLIDAYS - "Search thousands of cruises here." most expensive cruise ships of all time - The Telegraph. POSH - 'Port out, starboard home'. Printed on tickets of passengers on P&O (Peninsula and Orient) passenger vessels that travelled between UK and India in the days of the Raj. SHIP PARADE - "The online magazine dedicated to cuise ships." Taller than Nelson's Column and longer than three football fields - so how do cruise ships even stay afloat? The curious art of launching a cruise ship - The Telegraph. Virgin reveals adults-only cruise ship - "Scarlet Lady: Cruise like a rock star aboard Virgin Voyages' first ship." What you didn't know about the golden age of the ocean liner - The Telegraph. World's most luxurious cruise ship? - "Crystal Symphony voyage is a decidedly grownup affair." AIDA Cruises - since 1960. AUSSIE CRUISING - "Australia ruises and World Cruising." Azamara Club Cruises - since 2007. "You'll love where we take you." Luxury cruise vacations. CARNIVAL CRUISE LINES - since 1972. "Cruise Deals: Caribbean, Bahamas, Alaska, Mexico." CDF CroisiÈres de France - since 2007. Catering to the French cruise market, with French as the primary language used on board. The line offers cruises to the Mediterranean operating from mid-March until November. CELEBRITY CRUISES - since 1988. "Celebrity Cruises is consistently voted among the top cruise lines in the world. And we didn't get there by luck." CLEAN CRUISING - "Australia's Award-Winning Site for Cruises Worldwide." COMPAGNIE DU PONANT YACHT CRUISES - "Spirit of yacht cruising." For over 20 years now, Compagnie du Ponant has embodied the art of Yacht Cruises, combining a sophisticated à la française lifestyle on board with exploration and discovery. COSTA CRUISES - "All Inclusive Cruise Holiday." CRUISES INC. - "Your cruise vacation specialists." CRUISE LINES INTERNATIONAL ASSOCIATION - "Cruising. It's all about you." Crystal Cruises - since 1988. "All Inclusive Luxury Cruises." 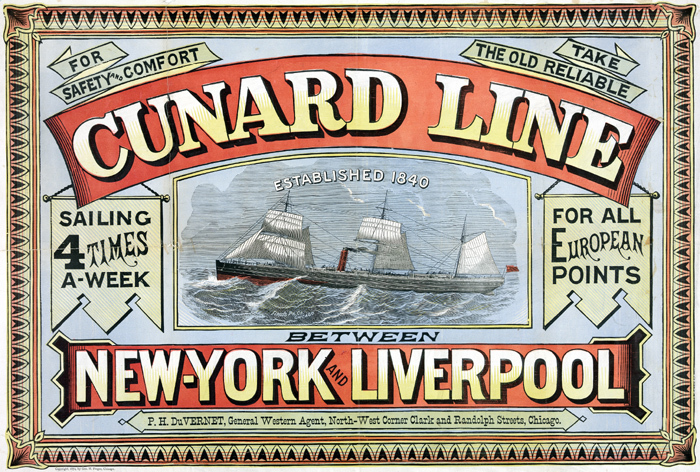 CUNARD LINE - founded in 1840. "The most famous ocean liners in the world. Enjoy worldwide cruise vacations and luxury cruises." Disney Cruise Line - since 1996. "Vacations with unique cruise activities for children, families and adults to destinations across the globe." Fred Olsen Cruise Lines - since 1848. "Cruise from the UK for Holidays to Europe and the World." French Line - since 1861. In 1977, the company merged with the Compagnie des Messageries Maritimes to form the Compagnie Générale Maritime. Hamburg America Line - founded in 1847. On September 1, 1970, after 123 years of independent existence, HAPAG merged with the Bremen-based North German Lloyd to form Hapag-Lloyd AG. Hapag-Lloyd cruises - since 1970. "Great Moments. Truly Exclusive." Hebridean Islands Cruises - "Luxury, small ship cruising as individual as you..."
HOLLAND AMERICA LINE - since 1873. "A Signature of Excellence." Cruises to Alaska, Europe, the Caribbean, Mexico and the world. Louis Cruises - cruises from Athens and Istanbul, to Greek Islands and Turkey. Mediterranean Shipping Cruises - MSC Cruises. Cruise to Mediterranean Italy, Greece, Spain, France. MSC CRUISES - since 1987. "Cruise to your preferred destinations with Italian Style." Nomade Yachting by Bora Bora Cruises - "Escape in style for a World of sensuality." Polynesian tropical paradise cruise in Bora Bora. Norddeutscher Lloyd - founded in 1857. On September 1, 1970, the company merged with Hamburg America Line (HAPAG) to form Hapag-Lloyd AG. North Star Cruises Australia - "Luxury Adventure Cruises." NORWEGIAN CRUISE LINE - since 1966. "Norwegian invites guests to 'Cruise Like a Norwegian' on one of 12 purpose-built Freestyle Cruising ships." NYK Cruises - luxury cruises. OCEANIA CRUISES - since 2002. "Your World. Your Way." Operates five premium luxury cruise ships on world-wide itineraries. Ocean Village cruises - "Second to none." ORIENT LINES - "The Destination Cruise Specialists." P&O CRUISES - since 1837. "Discover a different world..."
PAUL GAUGUIN CRUISES - since 1998. "The Gauguin is the longest continually operating year-round luxury cruise ship in the South Pacific." Peter Deilmann Cruises - German cruise company which has offered river cruises throughout Europe and several ocean cruises. PRINCESS CRUISES - since 1965. "Escape completely." Red Star Line - founded in 1871. The company operated until 1935 when, due to the economic depression they ceased trading and its assets were eventually sold to the Holland-America Line. REGENT SEVEN SEAS CRUISES - since 1990. "All Inclusive Luxury Cruises To Over 300 Ports World-Wide." Royal Caribbean International - since 1969. All ships under the Royal Caribbean International brand have had names ending in "of the Seas" since 1991. Saga CRUISES - since 1996. "Ocean Cruises." Seabourn Cruise Line - since 1986. "The world's best small-ship cruise line." Intimate luxury. Luxury cruises. SeaDream Yacht Club - since 2002. "It's yachting, not cruising." Enjoy the difference. SeaDream Yacht Club is different from big ship cruising. Our philosophy of casual perfection runs through everything we do. With only 56 couples being pampered by an award-winning crew of 95, the level of attention and service we pay to each of our guests makes yachting aboard either one of our mega-yachts SeaDream. SILVERSEA CRUISES - since 1994. "All Inclusive Luxury Cruises." Luxury cruise line that operates six luxury, all-suite cruise ships that sail itineraries all around the world throughout the year. Offers its guests with Personalized Voyages, a cruise industry first. STAR CLIPPERS - since 1992. "Sailing Tall Ship Cruises." Star Cruises - since 1993. "The leading Cruise Line in Asia-Pacific." The American Queen Steamboat Company - since 1995. American Queen is said to be the largest river steamboat ever built. Mississippi River cruises. The World - since 2002. "Residences at Sea." Private residential cruise ship serving as a residential community owned by its residents. True North - "Luxury Adventure Cruises." TUI Cruises - since 2007. Victoria Cruises - "The Majesty of the Yangtze." Since 1993, Victoria Cruises has been the leader in luxury river cruising. Based in New York, Victoria Cruises established new standards of excellence for sailing China’s Yangtze River when its first ship edged out of port in 1994. Victoria Cruises has a fleet of seven Five–Star Ultra–Luxury vessels (as designated by the China National Tourism Administration). Their ships are all newly built or structurally rebuilt, and all refurbished with a modern blend of European–Asian design. The architecture emphasizes spacious rooms with modern amenities including private balconies, bathtubs, and cable TV. All ships are fully equipped with wi–fi and international telecommunications systems. White Star Line - founded in 1845. In 1934 White Star merged with its chief rival, Cunard Line, which operated as Cunard-White Star Line until 1950. Cunard Line then operated as a separate entity until 2005 and is now part of Carnival Corporation & plc. As a lasting reminder of the White Star Line, modern Cunard ships use the term White Star Service to describe the level of customer care expected of the company. WONDERCRUISES - "There's so much to sea."